APTA Section on Pediatrics Annual Conference coming up! The APTA Section on Pediatrics Annual Conference (SoPAC) will be held November 11-13, 2016, at the Keystone Resort, Colorado. Five pre-conference courses (1/2 day to 2 days in length) will be held November 9-10. The 2016 SoPAC theme is: "Climb to New Peaks of Pediatric Excellence". SoPAC includes 17.75 hours of all-pediatric programming with concurrent sessions from all pediatric practice areas. The SoPAC Schedule-At-A-Glance and registration information can be accessed at www.sopac.us. Mark your calendars for Nov. 12! 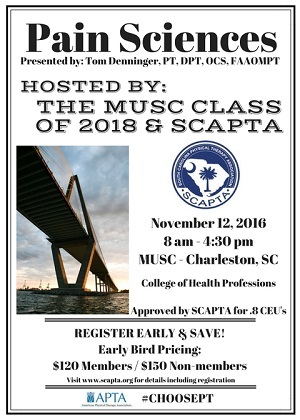 The MUSC Class of 2018 and SCAPTA are hosting a CEU on the pain sciences. The class will be held at MUSC Charleston from 8 a.m. - 4:30 p.m. Early registration is open now and it will be $120 for member and $150 for non-members. With professional and amateur football and soccer seasons beginning here is a reminder that PTs should be a part of the team that assesses and treats concussions and concussion disorders. For more information check out the APTA resources here.